Investors are always looking for a deal, or the best value available. This is the key to being a successful investor, and is also the most challenging element to investing. CLS feels that international emerging markets are poised for a take-off and are one of the best valued positions for portfolios right now. International small cap stocks have outperformed the broad international equity market so far this year. As the chart shows, the performance of MSCI EAFE Small Cap (Ticker: SCZ) has been much better than that of MSCI EAFE Index (Ticker: EFA). The earnings growth of EAFE small cap has been better than that of EAFE index. 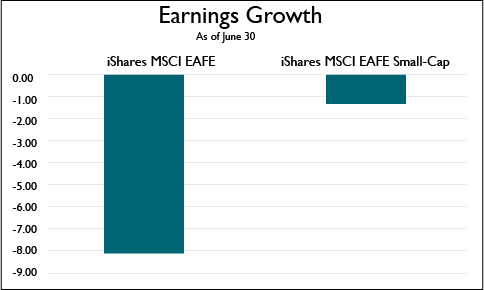 Shown by the chart below, though earnings growth from both indices are negative, earnings from EAFE small cap stocks have held up much better than that of the broad index. 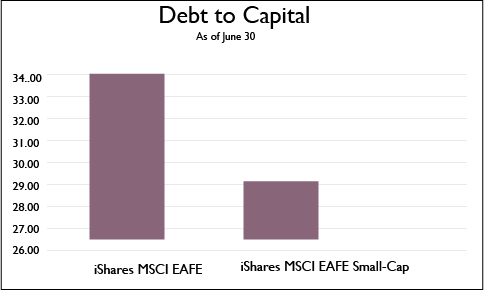 The financial leverage of EAFE small cap has been lower than that of the EAFE index. Less leverage offered more cushion for smaller firms during the global credit crisis. When liquidity drains or interest rates rise, it costs less for small firms to borrow funds because of the lower level of debt they carry. This advantage indirectly helps earnings and cash flows of small companies. The global economic recovery has been slow while inflation pressures have been muted. Most economists or strategists do not foresee a sharp rise in the global growth rate for the near future. I expect international small cap stocks will continue to outperform broad international markets due to their stronger earnings growth in this slow growth environment.